Bend’s first library was formed in 1904, not long after the city itself was established. Since that time, the organization has evolved, all the while maintaining a focus on providing spaces where the community can come together to meet, learn, share, and, of course, read. 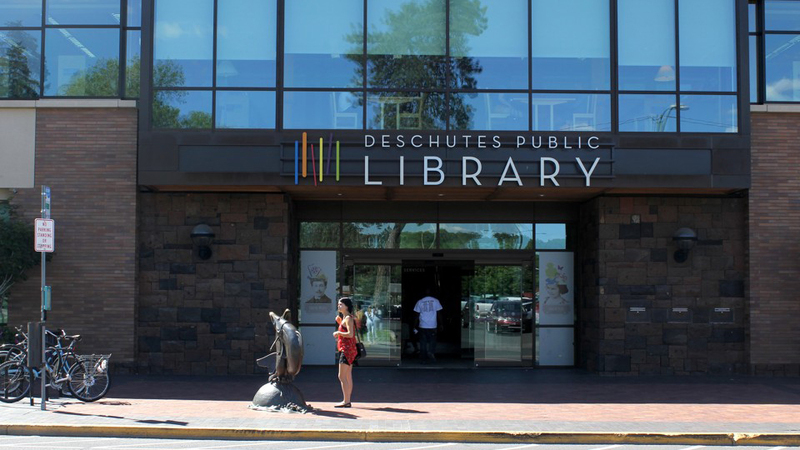 Today, Deschutes Public Library has a total of six branches in Bend, Sisters, Redmond, LaPine, and Sunriver and offers a range of services for every facet of the community. Children’s programming fosters a love of reading and learning through interactive story time at the library, homework resources for school-aged children, and a very popular summer reading program. DPL works in partnership with many local senior centers to provide Senior Book Club groups as well as monthly Library Rendezvous where retirement home residents go on recreational outings to their local branch. Ask a Librarian is a service providing brief answers to factual questions (asked via email, chat, or text), as well as suggestions for resources that might help you find what you need. All libraries offer free Wi-Fi as well as access to desktop computers for personal research, job searches, community connections and more. The library is also a great place for groups of up to 80 to meet, with multiple private meeting rooms available by reservation. Room sizes and schedules vary by location; please contact your local branch for pricing and availability.